Gaur City Center, the most awaited Commercial Project by Gaursons India Limited right at the first roundabout of Gaur City, Noida Extension famously known as "Gaur Chowk" and Kisan Chowk. Gaur City Centre is situated next to "Gaur Chowk" on 130 mt wide road and Spread across an area of 5.68 acres. 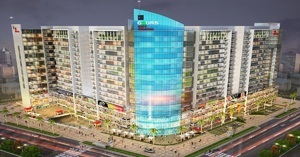 This stunning commercial retail project is connected to Gaur City Mall which has leading brands outlet, multiplex, office spaces, hotel and serviced studio apartments with all modern facilities. The project offers retail shops of different sizes at lower ground, ground floor and First Floor.